GVL / Sara Carte Chase Dolan speaks at the Campus Life Summit in the Mary Idema Pew Library on Friday, March 23. The most notable announcement during the general assembly was that the search for the new vice provost for student affairs and dean of students is nearing completion. While the names of the final four candidates are still confidential, the dates and times of when they will be giving presentations at GVSU have been released. Each candidate will come to GVSU on their own day, give a presentation about themselves and why they should have the position, and meet the faculty and staff they could potentially be working with. The dates are Friday, March 30; Tuesday, April 3; Thursday, April 5; and Friday, April 6. All the presentations will be from 1:30 p.m. to 3 p.m.
More progress has also been made regarding the possibility of a fall break at GVSU. Nothing can be confirmed yet, but recommendations from the fall break task force were brought to the executive committee of the senate (ECS) on Friday, March 23. The ECS tabled the discussion to a future meeting as more options are discussed, according to Bowman. While the current senate body is continuing to work on its own projects, the senators are also preparing transition reports for the new body to continue where they will leave off. Elections for the new body will begin Monday, March 26, at 8 a.m. and end Sunday, April 1, at 11:59 p.m.
Senate members believe it's important for all students to vote in the student senate elections because these are the people who will be representing their voices on campus. 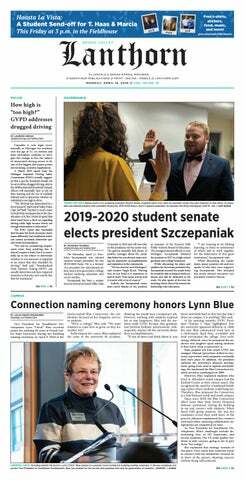 “The student senate elections are a super pivotal time of the school year for the student body," said Morgan Mattler, chair of the public relations committee. "This is when students come together and vote for who is representing their interests, their complaints, their concerns, their worries, anything and everything about their student experience. GVSU students will be able to vote in the student senate elections at www.gvsu.edu/studentsenate/elections. GVSU’s student senate meets every Thursday at 4:30 p.m. in the Pere Marquette Room of the Kirkhof Center for its general assembly.